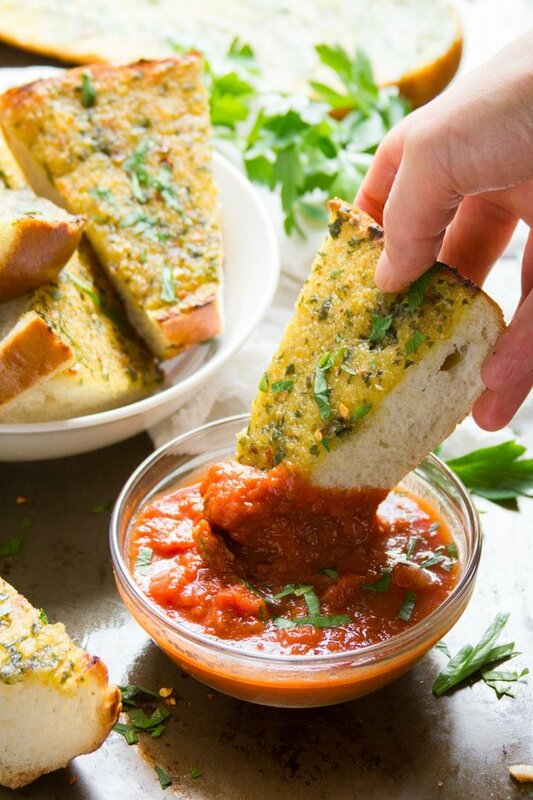 The best garlic bread you’ve ever tasted, and it just happens to be vegan! 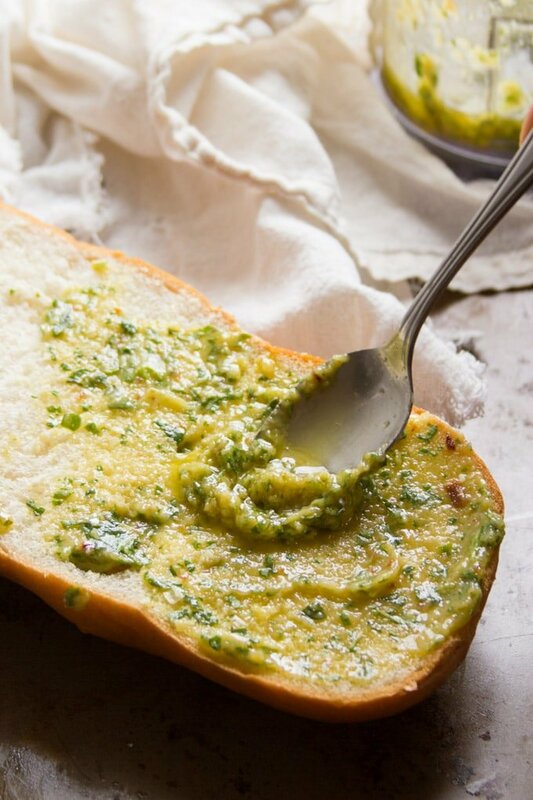 The trick: whip up mellow roasted garlic and olive oil to create a creamy, flavor-packed emulsion, slather it on crusty Italian bread, then toast to crispy perfection. 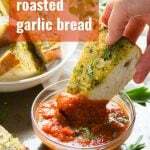 So I never really thought I needed a recipe for vegan garlic bread. I’ve been making vegan garlic bread since I was a kid. I had my own recipe: slather some bread with vegan butter (I called it margarine back then), sprinkle with garlic salt, and broil. Sound like your recipe? It probably sounds like everyone’s recipe. And hey, it’s not bad. It’s vegan by default, assuming the margarine you used was dairy-free. 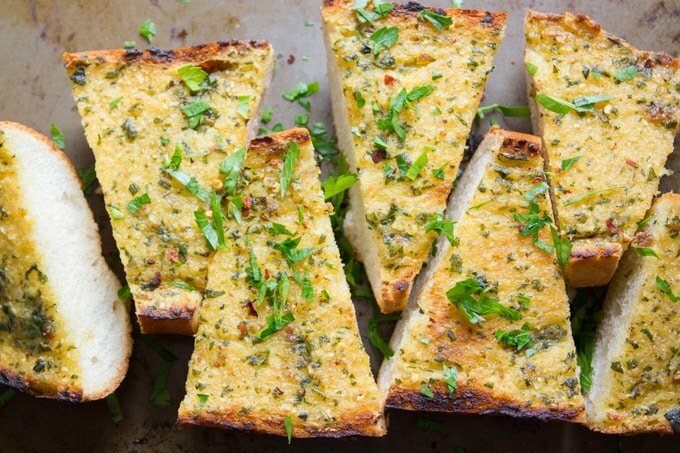 But then one day it hit me: I should make some garlic bread with roasted garlic. Best. Idea. Ever. Okay, so here’s how this one works! You’ll need to roast some garlic first. If you’re new to garlic roasting, don’t be alarmed by the fact that this recipe calls for two whole (large!) garlic bulbs. Roasted garlic is nowhere near as intense as raw garlic. In fact, the flavor is super mellow. So mellow that I threw a single raw garlic clove into the mix. And you know what? That one raw clove adds more bite than the two whole roasted bulbs. 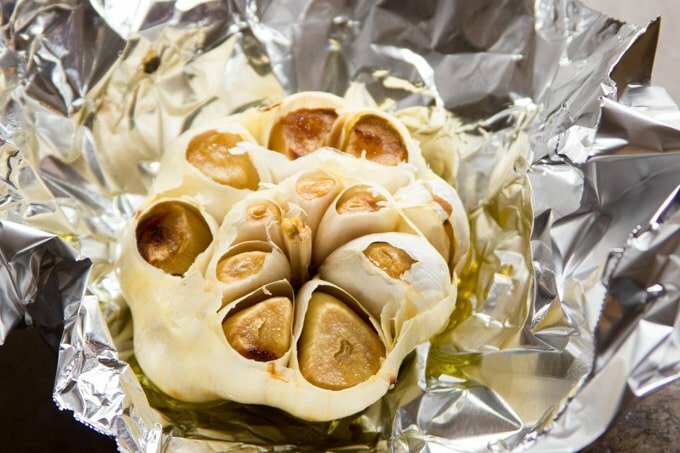 Cut the top off of your garlic bulbs, so the cloves are exposed, then drizzle with olive oil, wrap loosely in foil, and roast away. It’s done when the cloves are nicely brown and super soft. Add the roasted garlic to your food processor, along with that one raw garlic clove, some salt and olive oil. Since you’ll be blending up a small amount of ingredients, a mini food processor works great here. I used this little Ninja. If you don’t have one you can just mash the roasted garlic with a fork, mince the raw garlic, and mix everything by hand. Then add some basil. This is totally optional, but very delicious. Slice your loves in half, lengthwise, and slather with the roasted garlic mixture. Bake it up, and then broil for a minute or two for some extra browning if you like. Slice and enjoy. Try not to eat the whole loaf at once. If you’re opposed to cooking with foil, try a garlic roaster. Roasted garlic is freezer friendly, so every time I make it I roast a few extra bulbs for later. Wrap each bulb in plastic, then stick them all into a freezer bag and seal it tight. The best garlic bread you've ever tasted, and it just happens to be vegan! 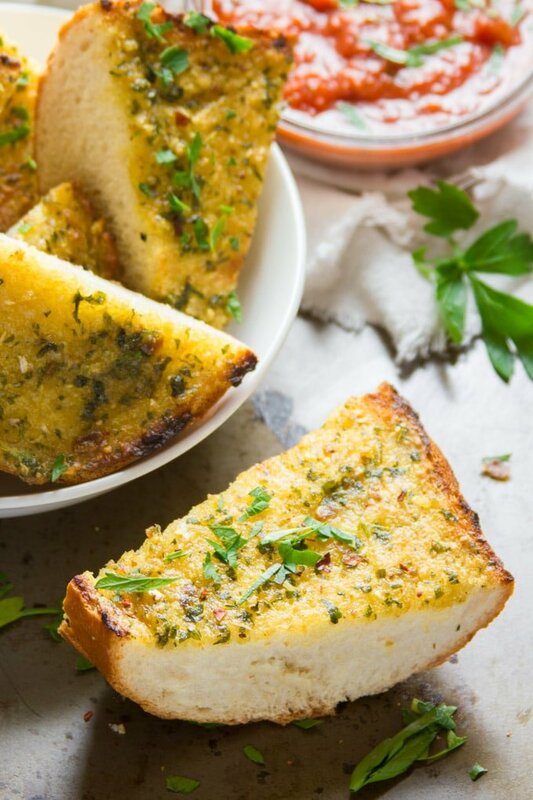 The trick: whip up mellow roasted garlic and olive oil to create a creamy, flavor-packed emulsion, slather it on crusty Italian bread, then toast to crispy perfection. Remove one garlic clove from one of the bulbs and set it aside. Cut the tops off of your garlic bulbs, then arrange each on a sheet of foil. Drizzle each with a tablespoon of olive oil, then loosely enclose in the foil. Roast the garlic until the cloves are soft and browned. Remove the garlic from the oven, loosen the foil, and allow the bulbs to cool for a few minutes. Leave the oven on. When the garlic is cool enough to handle, squeeze the bulbs to extract the roasted garlic. It will be super soft. 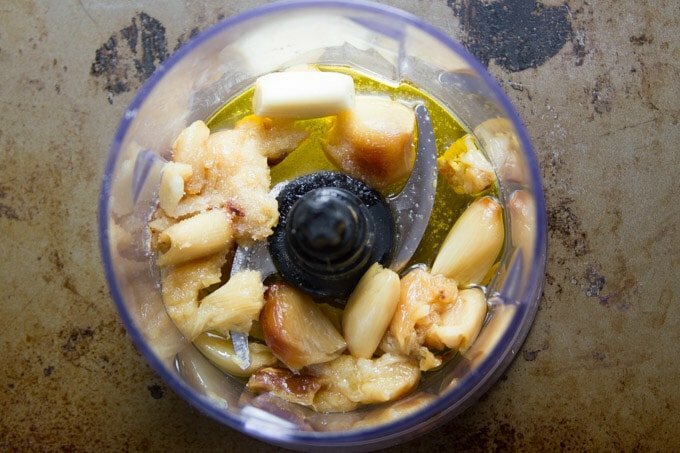 Place the roasted garlic into the bowl of a food processor (preferably a mini one - see note), along with the raw garlic clove, 1/2 cup of olive oil, and salt. Blend until smooth. Add the basil and pulse the food processor until it is finely chopped. Taste test and season with red pepper flakes and additional salt if you like. Slice the loaf of bread in half, lengthwise, then slather the cut side of each half with the roasted garlic mixture. Place the loaves into the oven, directly on the rack, cut side up. Bake for 10 minutes or until crispy. Optionally, place the loaves under the broiler for 1-2 minutes at the end of baking. 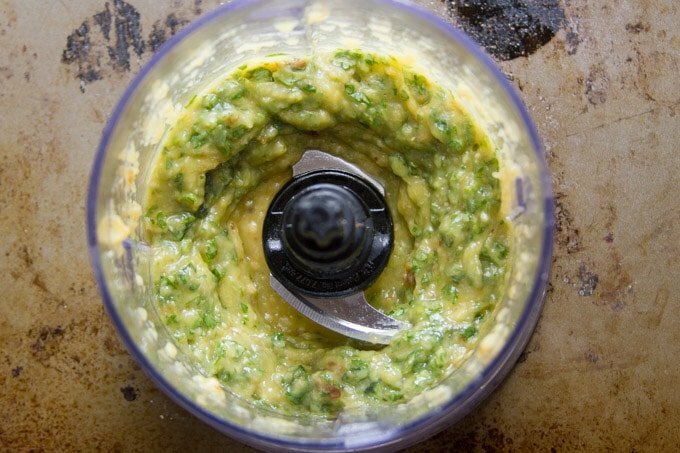 If you don't have a mini food processor, either double the batch size (you can freeze half for later) or mince the raw garlic, chop the basil, and mash the roasted garlic with a fork, and then mix everything together by hand. Hi there, please clarify step #11…place directly on to rack, cut side down? Doesn’t the cut side have all the oil/garlic mixture? Thanks. Yay!! I’m so glad you both like it! Yay!! I’m so glad you enjoyed it! 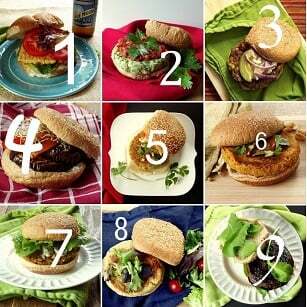 This should be the most popular recipe on the internet! That is how much I loved it. Yay! I’m so glad you like it! Thanks so much Jean!